In advance of the release of his long-awaited second book, “The Journey Within: Exploring the Path of Bhakti,” Radhanath Swami met with thousands of followers in Nabadwip, India tonight for satsang (spiritual discourse). 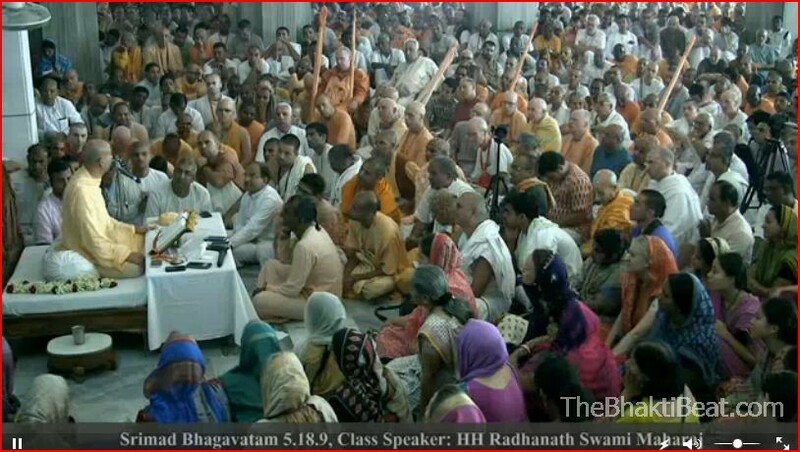 “If we were diagnosed with cancer, and the doctor prescribed medicine that would cure it, and said we must take the cure regularly, we would take that very seriously,” he said in a characteristically down-to-earth teaching before the large gathering of devotees, which was livecast on Mayapur.TV. “The diseases of envy and forgetfulness of our eternal nature are limitlessly more dangerous than any disease of this Earth,” Radhanath Maharaja said. Nabadwip is the birthplace of the great Vaishnava saint Caitanya Mahaprabhu, a social reformer who rejuvenated the bhakti movement in the 1500’s. Devotees believe that Caitanya was Krishna himself, incarnated as a disciple so that he could taste the sweetness of his most beloved devotee, Radharani. Radhanath Swami is a revered spiritual leader within the Krishna Consciousness movement and beyond. His first book, “The Journey Home,” has fast become a spiritual classic tells the story of his coming of age as American yogi in India and his discovery of bhakti yoga. The forthcoming second book, which seeks to “demystify” the ancient practice of bhakti yoga, is now available for pre-order at Amazon.com. He is in the Mayapur region as part of a month-long tour throughout India in advance of the International Yoga Conference in Rishikesh March 5-7. He returns to the West in May for a retreat at Sivananda Yoga Ashram in the Bahamas with his disciple Gaura Vani, a beloved American kirtan wallah and prominent figure in the Western bhakti movement.